The smart sensor market is expected to grow from USD 18.58 Billion in 2015 to USD 57.77 Billion by 2022, at a CAGR of 18.1% between 2016 and 2022. In terms of unit shipments, the global smart sensor market is estimated to grow at a double digit growth rate between 2016 and 2022. The base year considered for the study is 2015 and the forecast for the market size is provided for the period between 2016 and 2022. In the current market scenario, there is a growing demand for smart sensors in the consumer electronics industry, automotive industry, healthcare industry, and in some industrial sectors such as textile, material manufacturing, and F&B among others. This is attributed to the increasing demand for sensing technologies among various sectors and the growing vehicle production in economies such as Japan, China, the U.S., and India. 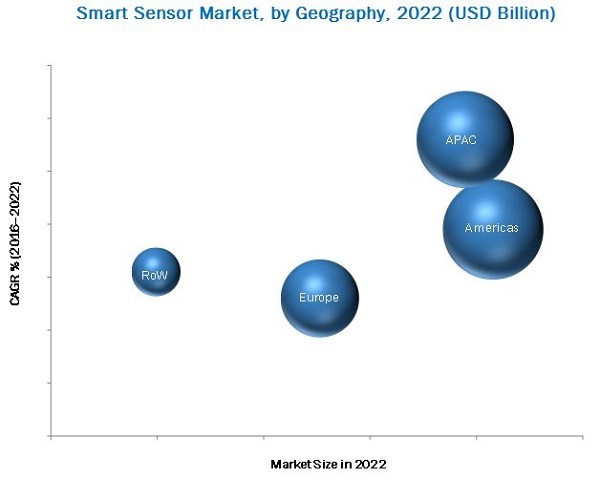 This report aims to estimate the market size and future growth potential of the smart sensor market across different segments such as sensor type, technology, component, network connectivity, end-user industries, and geography. Factors such as the growing concern toward security & surveillance, increasing need for energy-efficient devices, growing consumer electronics sector, surge in automotive industry on a global basis, favorable government initiatives, and growing trend of miniaturization in the sensors segment are expected to boost the growth of the market during the forecast period. The smart sensor ecosystem comprises of chip designers such as Analog Devices, Inc. (U.S.), Micron Technology, Inc. (U.S.), and Qualcomm Inc. (U.S.) among others; component manufacturers such as Atmel Corporation (U.S.), NXP Semiconductors N.V. (Netherlands), Infineon Technologies (U.S.), ABB Ltd. (Switzerland), and Texas Instruments Inc. (U.S.) among others; technology providers such as InvenSense, Inc. (U.S.), STMicroelectronics N.V. (Switzerland), and Robert Bosch GmbH (Germany) among others; and system integrators such as Samsung C&T Corporation (South Korea) and Sony Corporation (Japan) among others who integrate these smart sensors and sell them to end users to cater to their unique business requirements. The smart sensor market is expected to grow from USD 18.58 Billion in 2015 to USD 57.77 Billion by 2022, at a CAGR of 18.1% between 2016 and 2022. The smart sensor market size, in terms of unit shipments, is estimated to witness double-digit growth rate during the forecast period. The smart sensor is currently witnessing rising demand in the automotive and consumer electronics industries as they are among the most recommended devices used for measuring, controlling, computing, and communicating. Factors such growing consumer electronics sector, surge in the automotive industry on a global basis, favorable government initiatives, and growing trend of miniaturization in sensors are some of the major growth drivers for this market. The scope of this report covers the smart sensor market segmented on the basis sensor type, technology, component, network connectivity, end-user industry, and geography. In terms of sensor type, the smart pressure sensor is expected to hold the largest market share and dominate the market between 2016 and 2022. MEMS-based pressure sensors are widely utilized in automotive, industrial, healthcare, and consumer electronics industries. In terms of technology, MEMS-based smart sensor is expected to hold the largest market share and dominate the smart sensor market between 2016 and 2022. Of all the end-user industries considered for this study, the consumer electronics industry is expected to hold the largest market share and dominate the smart sensor market between 2016 and 2022; it is expected to grow at the highest rate between 2016 and 2022. Smart sensors are used in consumer electronics to measure various parameters such as motion, temperature, and pressure among others. They are widely adopted in numerous devices such as smartphones, gaming consoles, PCs, home appliances, and kitchen appliances among others. The Americas is expected to hold the largest market share and dominate the smart sensor market between 2016 and 2022 owing to the growing demand for smart homes and IoT in the U.S., presence of major players in the region, early adoption of technology in the Americas, and growing automotive and consumer electronics industries in the region. The APAC region offers potential growth opportunities owing to increasing government support and demand from growing economies such as China and India among others. The more complex structure of smart sensors as compared to simple sensor and high development cost are the key factors that are restraining the growth of the smart sensor market. The major vendors in the studied market include Analog Devices, Inc. (U.S.), Infineon Technologies AG (Germany), STMicroelectronics N.V. (Switzerland), TE Connectivity, Inc. (U.S.), Atmel Corporation (U.S.), NXP Semiconductors N.V. (Netherlands), ABB Ltd. (Switzerland), Siemens AG (Germany), InvenSense, Inc. (U.S.), Robert Bosch GmbH (Germany), Honeywell International Inc. (U.S.), Eaton Corporation Plc (Ireland), Emerson Electric Company (U.S.), General Electric Company (U.S.), Legrand S.A. (France), and Sensirion AG (Switzerland) among others. These players adopted various strategies such as new product developments, mergers, partnerships, collaborations, and business expansion to cater to the needs of the smart sensor market. 13.3.1 XYZ Interactive Technologies Inc.